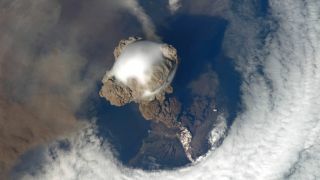 Crew aboard the International Space Station captured this image of the Sarychev Volcano as it erupted on June 12, 2009. Sarychev Peak is located in the northern part of the Kuril Islands, a Russian archipelago in the northwest Pacific. On June 12, 2009, the International Space Station happened to be passing over the Sarychev Volcano just as it was beginning to erupt. A newly released video based on several stunning snapshots taken by astronauts reveals the beauty and power of the erupting volcano. Sarychev Peak, which rises to a height of 4,908 feet (about 1,500 meters), is the tallest peak on Matua Island in the northern part of the Kuril Islands, a Russian archipelago in the northwest Pacific Ocean. The volcano, one of the most active volcanoes in the Kuril Island chain, erupted in 1989, 1986, 1976 and 1946. On the ground, denser, gray ash, known as pyroclastic flows, can be seen. Scientists can't quite figure out what caused the round hole in the cloud above the volcano. One explanation is that it's pure coincidence and has nothing to do with the eruption. Other possibilities could be the shockwave from the eruption pushed the overlying atmosphere upward, punching a hole in the cloud, or the clouds there evaporated as the hot ash rose upward. Satellite images have also revealed the aftermath of the eruption. For instance, images taken before (in 2007) and after the eruption on June 30, 2009, showed that while vegetation covers much of the island, a carpet of pyroclastic flow and settled ash veiled nearly all of the vegetation on the island's northwestern end, according to NASA Earth Observatory. Follow Live Science @livescience, Facebook & Google+.